It's time to explore the world again! The fourth post in this editorial series with au pair agency Cultural Care Au Pair focuses on Sweden. 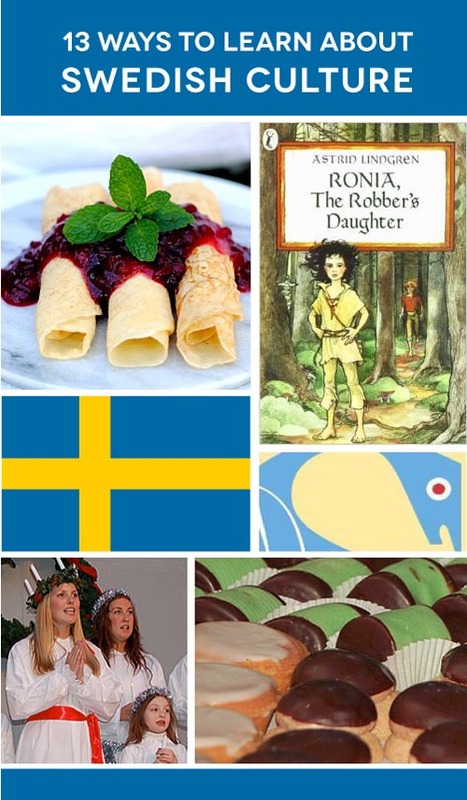 Here are 13 ways to introduce your family to Swedish culture. And as with the other culture posts, for my readers outside of Massachusetts, there are a number of recommendations below that can be enjoyed from anywhere! 1. The Scandinavian Cultural Center in West Newton is a hub for Nordic cultural activities. The center hosts notable Scandinavian speakers, shows cultural movies, and is home to the Kaffestugan coffee shop where you can enjoy Scandinavian treats. The Center is also home to The Scandinavian Library where you can take Swedish language classes. 2. Are you a pop music fan? I was totally intrigued by Nolan Feeney's article Why Is Sweden So Good at Pop Music? (written in honor of Ace of Bace's 20th anniversary of The Sign). 3. Love dancing? See if you can pull of the Polska, a traditional Swedish dance. 4. Mark your calendar for the Swedish Yuletide celebration December 5, 2015! 5. Also handy for getting festive in Swedish style around the holidays is A Swedish Christmas: Simple Scandanavian Crafts, Recipes, and Decorations. 6. Enjoy Swedish and Scandinavian food at A Swedish Shop in West Bridgewater. The shop includes jewelry and traditional crafts to look through while visiting this little store. 7. From Swedish tea biscuits to troll and Viking trinkets, The Gift Chalet offers a wide array of Scandanavian gifts. 8. Shake up your breakfast with these tasty Swedish pancakes. 9. Make a Viking out of a toilet paper roll! 10. Get the whole family to make Swedish flags by sponge painting. 11. Learn more about Sweden, Greenland, and other Nordic countries through D is for Dala Horse: A Nordic Countries Alphabet. 12. Ronia, the Robber's Daughter, by Swedish author Astrid Lindgren, tells the story of Ronia, who lives with her father and a band of robbers in a castle in the woods. Follow her adventures as she befriends a rival robber’s son. 13. Another Astrid Lindgren classic is The Adventures of Pippi Longstocking, a great story about a spunky nine-year-old girl who lives alone (with a monkey) in a wacky house. Image credit: Compilation graphic by Christine Koh with images via linked sources above.